Since it is designed by a manufacturing brand that has been making knives for close to one hundred and twenty years now, it goes without saying that the 390 Omni Hunter is at least worth considering. This one’s a classic hunting knife that comes with a handle in a camo design. Its construction, rigidity, strength, edge retention as well as its user-friendly features all recommend it. Let’s look at some of the things that seem to make it stand out from the crowd so that you can make the right decision and see whether it suits your needs. Let’s start with the size so that you can tell whether you’ll find it hard or easy to use this hunting knife. While the blade measures 3.25 inches, the overall length of this tool is 7.75. It weighs in at 4.6 ounces, which means that it is easy to hold and handle. One area where this product truly shines is the handle it is equipped with. It is rubberized, so you can rest assured that you won’t injure yourself while slicing meat or while you are skinning your prey. You can also utilize this product for survival applications, by the way, especially since you can hold it properly and the blade it comes with makes it a good fit for such purposes. The handle boasts a Realtree Camo design, which will assist you in blending into the hunting environment as best as possible. If we can add something with this respect, we’d like to note that a black blade would have been a bit more useful than the one that this knife is equipped with. The black matte design would have been capable of making light reflections practically impossible, thereby further adding to your stealth. However, the 390 Omni Hunter comes with a 420 HC steel blade which is said to have excellent corrosion-resistant properties, and that seems to be capable of retaining its edge for a long time. You can conveniently re-sharpen the blade without encountering any issues, especially judging by the feedback provided by other hunters in this sense. The best thing about the high carbon stainless steel that the blade is crafted from is that it can be sharpened to a mirror finish and a very fine cutting edge. As such, you will be able to benefit from excellent sharpness, allowing you to perform your tasks in a timely fashion and with significantly less effort than you’d have to make if you were to use a duller knife. As for safety, you needn’t worry about anything with this product since it comes with the rubberized handle that we have mentioned already, and the latter boasts grip ridges so that you can handle it safely and effectively. The lanyard hole will allow you to attach the knife to pretty much any accessory. You can even leave it to hang in its sheath from a backpack strap if you do not like carrying it on your belt. Part of the reason that you ought to consider this unit is its versatility. Due to the blade and its excellent handle, this knife is capable of serving you in a myriad of situations, something that you might not expect from all types of hunting knives. For example, there’s nothing stopping you from utilizing the 390 Omni Hunter to split some wood (just not logs) for a nighttime fire that you might have to build if you intend to spend more than one day hunting in the woods, should you decide to do so. 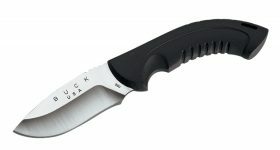 Naturally, this knife can get you out of a tricky situation when you have to deter wild animals, especially while you are sleeping. The knife is accompanied by a Realtree Camo Sheath that will allow you to keep your stealth as you walk through the hunting environment in search for the perfect vantage point to see your potential targets. The nylon sheath is equipped with a snap closure. 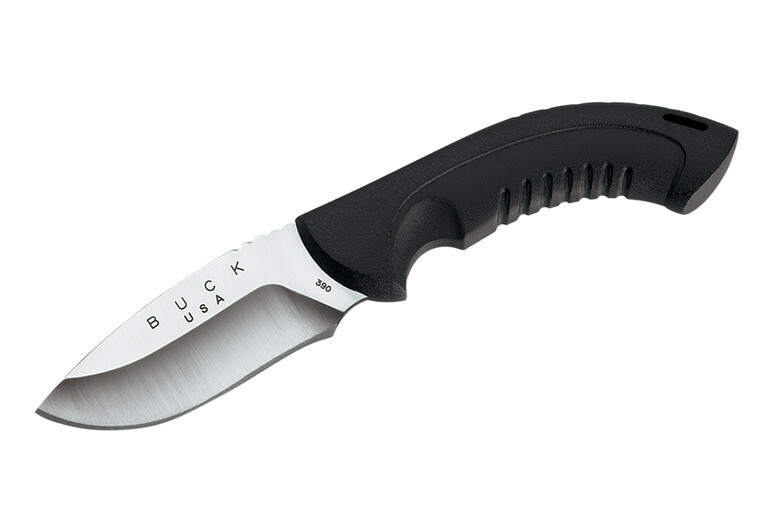 Despite the fact that this particular hunting knife is one of the most affordable options that we were able to track down nowadays, it is manufactured in the United States of America and best of all, it is backed by the Buck Lifetime Warranty. What this means for you is that, should you receive a product that fails to meet your expectations in terms of performance (whether it is regarding the blade or the handle), you can simply get in touch with the manufacturer’s customer service and they will swiftly solve the problem.